I agree. An original case would be the best. They are just hard to find & expensive. I had not seen the second one you listed. Cheapest I had seen befor now was 250$ plus shipping. Thanks for the heads up. I found another at Reverb. A bit of a beater but solid. Priced too high but it's reverb & seller may be looking for offers. Looks good to me and it's a beauty… What did you pay for it if you don't mind telling… I don't think the blues hawk was a popular enough or expensive enough guitar for anyone to consider making counterfeits. I don't think I have ever seen one that has a bigsby on it before so it's either a rare one or someone had it modded. Either way just enjoy the guitar, if you got it for a good price you did very well…. hi, thank so much for your answer, the guitar cost me around US$ 1,100. It's a model who comes with the Maestro Trem originally.... and yes i realy enjoy it, a great guitar! Great looking BluesHawk Max. And yes the Maestro Trem was a factory option. It is interesting that most of the Maestros seem to have ended up on blue Blueshawks. Maybe somebody of you guys knows about that. For all Blueshawk-Lovers. The blueshawk.info site is shut down since a few months - why I don't know, but the guy who made it was sick as far as I know. Maybe he couldn't handle it any longer, but I hope he's alright. Anyways, I found a site where you can look at the homepage as PDF. I will upgrade my Blueshawk with golden Mini-Humbuckers from bg-pups.com - hopefully they will arrive next week. 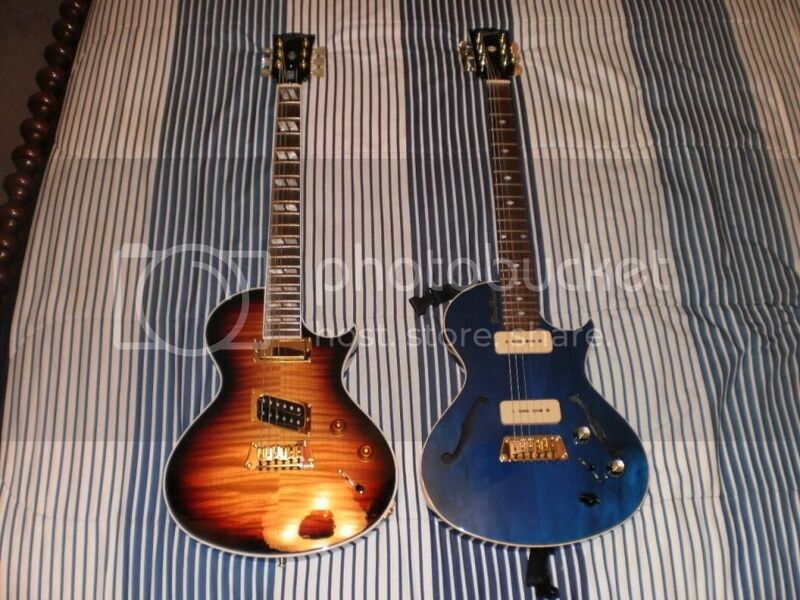 Once I had this combination with Gibson Minis but they where not good balanced. The bridge where too low in output but I loved the sound of the Mini-humbuckers so hopefully this time it'll be a good Set - although I always had amazing stuff from Mr. Bryan Gunsher so no concerns here. Just wanted to give you all the chance to see those informations from the blueshawk site. I received the Mini Humbuckers a few days ago. What a great guitar. Now it sounds like it grown up. While I have had to wait for the pups I tried the stock pups, just for fun, but after half an hour I put them away. I'll keep them, just in case I'd ever sell her (no Way ) but I'd never use them again. Any pup would sound better than the Blues90 - that's my personal meaning. In this guitar I have tried P90 (this was not my sound), than Gibson Mini Humbucker (they sounded great but where not good matched, the bridge was too low in output and could not keep up with the neck), than I put in Häussel Tronebucker (very good pups - now installed in a Strat), after that I thought I need TV-Jones T-Armonds for 50s Rock&Roll but Pups alone can not do miracles. Although they are really unbelieveable great pups they didn't stand out, played with the whole band. So I thought, what was the best pup/guitar combination I had? The Minis where the only solution for me. And I was right. This is the sound I had in my head - they are hotter then normal Minis (10,7k &12,7k) but they clean up nicely but when I turn up the volume knob they punch you in the face.